Cloud Computing Efficiency How does local and cloud computing compare? How does Cloud Computing (CC) efficiency help you? Should your applications be located locally or hosted from Cloud Computing? What should be considered in designing modern Cloud Computing infrastructure? How can Cloud Computing help with efficiency? Where is Cloud Computing available now? What are local Computer Advantages? What are local computer disadvantages? Cloud computing can be described as a combination of virtualization servers providing scalable services, applications, storage and infrastructure for multiple clients over the Internet. By combining cloud computer clients the efficiency per physical hosted server is improved greatly. Consolidation of 10 virtual servers :1 physical server and 40 virtual :1 physical server for desktop clients is possible. Servers, desktop clients and telephony can be virtualized. End users can use thin clients for computer and telephony activity for further energy efficiency. Modern virtual server environments can allocate resources as demand requires including powering down physical servers when requirements are low automatically. Virtual telephony with multiple clients can handle 1000's of users from the same hosted VOIP hardware. Not having a local PABX phone system reduces energy consumption and cooling requirements. Business phone lines can be replaced by business broadband connection saving in phone line rental fees. Some VOIP telephony can reduce long distance phone call charges by using the business wide area network for transport. Economy of scale can be used in charges of phone calls. VOIP handsets can be connected to the local area network (LAN) and the local computer. This can half the cabling requirements per work point. Rapid deployment of services. Deployment in 1 day is possible. Quicker testing cycles. Less money needed for on site hardware, administration and maintenance required. Application access is independent of operating system, Internet browser and computing device type. Scalable to handle variable business needs. Access to large expensive hardware and services with little capital costs. Electricity costs for local servers is saved in a cloud environment. Virtual cloud servers save on electricity by sharing. Disaster recovery from a local event. Easy to set up quickly in a new location. Data access independent of location or device. E.g. Home, work or while traveling. Mobile computing data access. Telephony can also now be hosted. National Fibre Broadband Internet (NBN) access will allow more access to cloud infrastructure. Save about $1000/year in electricity for each physical server (including cooling) by not deploying locally. Storage costs are shared which can lower client level fees. Lower data centre costs. Less space, cooling, UPS and generator requirements. Business data is stored off site. What happens to your data if your provider goes out of business? If the Internet is down locally then Cloud applications may be unavailable. Some offline synchronising application options exist. Encryption of data transmission and storage needs to be considered. Training of programmers with cloud standards. Intellectual Property stored off site. Cloud computing may not have efficiency in large organizations. Create a local virtual computing environment for servers and desktops. This can also be used for branch offices and remote users. Use applications with web services. This can assist in future proofing application standards. Use cloud computing standards on a local server. This could create a new revenue source if shared. New computer hardware may require 1 month in delivery, planning, standard operating environment design, security. Application user licenses and server client access license (CAL) costs. Does this style of computer infrastructure suit you? What about in the future? 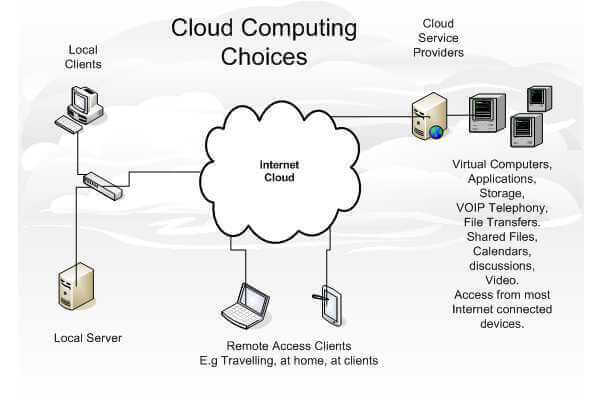 Cloud Computing Possibilities - Explains what services are available now. Virtual Server Hosting - How can virtual servers be done now. Hosted VOIP - Have telephony services without a local phone system.